I just got a new go kart engine, i went from 6hp to 10hp. This new kohler engine I got I think was not built to put on a go kart, so I had some trouble finding a way to attach the gas petal. Well after a few days of not really figuring anything out, I remembered that I had gotten an arduino about a week ago, and maybe I could use this to help me out. 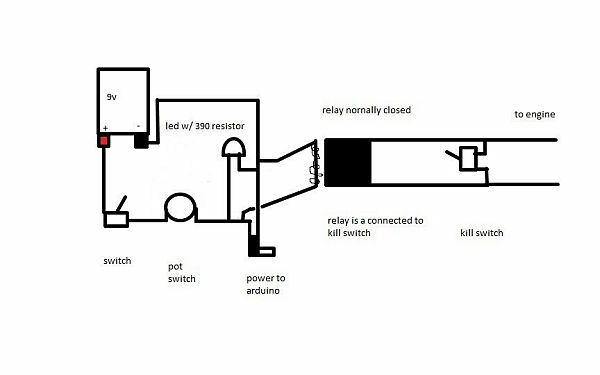 below is a diagram of how I go power to the arduino. this way the engine will only start if the arduino is powered on. the first switch is mounted on the box that holds the arduino. the potentiometer i got has a built in switch so to turn on the arduino you have to flip the switch to the box and then turn the potentiometer. 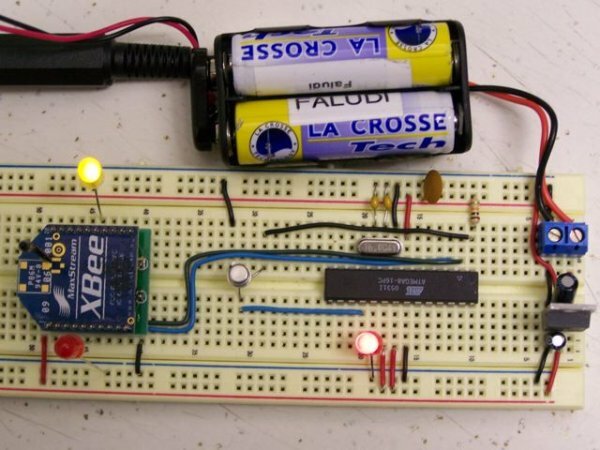 i used the led as status light to let me know that the arduino is powered on. i used the relay as a kill switch because if some how the arduino’s battery died and the throttle was opened all the way up, it would be very hard to stop. I also put in a manual kill switch. Also below is what I actually did. after i got the arduino i ordered the protoshield and put it together with a few modifications to allow me connect the servo and the pot a little easier. Make sure you know what wire connects to what wire especially if you use a usb port to connect the potentiometer and servo. Now its time to attach the servo. for this I used an “L” bracket (like the kind you would use for book shelves) and cut it in half. Next I drilled the new holes that were going to be used to mount the servo. following that i built a holder for the servo out of an erector set i had then bolted it to the cut in half “L” bracket. finnally i cut to fit the throttle linkage cable and attached it to the carb and the servo, so when the servo turns it also turns the carb. Also i put rubber spacers to absorb shock.